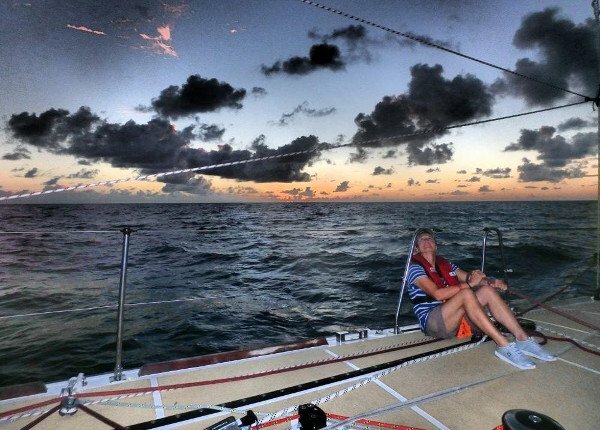 Ocean sailing is the type of adventure that brings a collection of excitement, fear, a test of skills and the occasional bout with flat calm situations. This, any sailor will tell you, is what separates the real salts from the dilettantes. When boats are becalmed, only those who are truly seduced by the sea can properly hang. Hours in silence, with nothing but sky and ocean, can amplify every creak and flup on the yacht, but the real mariners know how to maximize the situation. They can watch the waves for any light puffs and capitalize on them. Skulling is also an option to create motion, and the time can also be used to keep house, design new tactics, or invent new and exciting beverages. The Fleet of the Clipper round the World Race, on its seventh leg, has been enduring such conditions in the southwest Pacific Ocean. But now a significant wind-shift from south to north, bringing with it decent breeze, has been a boon to the fleet, giving it a windward beat after most of the teams came to a standstill, Jan 23. All the boats are deep into the Inter Tropical Convergence Zone, commonly known as the Doldrums, and closer to the north-east Trade Winds – a system that take the boats toward Vietnam in what is now known as the Da Nang New Discovery of Asia Race. Sixth place Da Nang – Viet Nam skipper Wendy Tuck said in her blog that good, stiff winds are now with her crew. Still, with GREAT Britain now first, and Derry~Londonderry~Doire second, she remarks that the standings are almost as fickle as the winds. Just behind Tuck is Darren Ladd, Skipper of IchorCoal. He said in his blog the conditions had improved as well. Follow the race at Clipper Round the World.